In 2012, Vale was chosen as the world’s worst corporation in the Public Eye Awards, the “Nobel” of global corporate shame. In the same year “The International Articulation of those Affected by Vale” published the excellent “Vale 2012 Unsustainability Report”. The report in Portuguese and English shows a side of the story that the company wants to hide: it denounces the socio-environmental impacts of Vale operations and the irregularities committed in many countries: from New Caledonia in nickel mining against the indigenous Kanak population over its troubles in Sudbury (Canada) against striking unionized workers to its cruelty in the coal mine of El Hatillo in El Cesar (Colombia) refusing to pay resettlement costs for the displaced population. The report gives voice to the affected people. Vale is present in 38 countries. In Mozambique the Moatize mining mega project removed 760 of the 1,313 peasant farmer families registered to make ways for the opening of coal mines. The families have been divided between rural and semi-urban and the “rural” ones were relocated 45 km from their community of origin. After Rio+20, Boaventura de Souza Santos, sociologist and professor at the University of Coimbra (Portugal), published an article called “Mozambique: the curse of abundance?” talking about the risks of poor countries where natural resources are discovered, and internationally coveted. The abundance distorts the development of the country and at the end the risk is that the country becomes economic, social, political and culturally poorer than it was before. This problem is better known as the Resource Curse. In Mozambique, Boaventura noticed the minimal economic contribution from Vale, the violation of human rights, the disrespect for sacred places and the natural environment, the repression from the police and military forces. As an example of the violation of human rights, in June 2012 the activist Jeremias Vunjanhe was prevented from entering Brazil and deported. 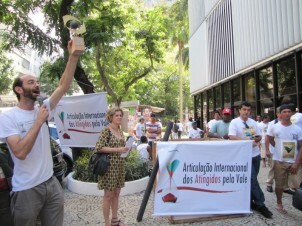 Jeremias carried with him evidence against Vale to be presented at the Rio+20 conference. A few days later he was allowed to enter Brazil due to strong international pressure. Vale is the second largest mining corporation in the world, operating in five continents. It has operated in Rio de Janeiro in association with Thyssen-Krupp (who featured in an EJOLT blog). The resistance against the company is everywhere, even in her birthplace: the Minas Gerais State in Brazil. Vale’s activities are threatening the water of more than five million inhabitants of the metropolitan region of Belo Horizonte, capital of Minas Gerais, among other socio-environmental impacts. Gandarela Mountain Range is responsible for 60% of the water supply of the large city of Belo Horizonte, and 45% of its metropolitan area. The mining project would destroy a geological system that stores water for millions of years now. The resistance movement fights for the right of water and for the right to decide the future of their own territory. The conflict arises from the Apolo Project, which aims to have an initial production of 24 million tons of iron ore per year, with expansion prospects to 37.5 million tons per year. It would last for 15 to 20 years, leaving damaged landscapes, tailings, contamination, high biological diversity impacted, loss of historical notable attributes, the extermination of the geosystem storage water and the destruction of paleontological sites. In addition, initial studies have pointed the existence of a cave from a giant armadillo that would have inhabited the region until 10.000 years ago. From the conservationist side, there is a proposal to create a National Park in the same area due to its national environmental importance. There is already a consensus among government, mining companies and civil society to establish the Gandarela Mountain Range National Park. The trouble lies in its exact delimitation, which portions may be granted or not to mining companies. 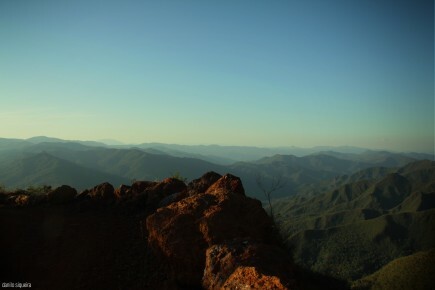 Mining in some of the areas designated for the Park would compromise the environmental qualities that justify its establishment in the first place. “The right to say NO! NO! to the extermination of our waters and mountains! NO! to the power of the economy over life! For the right of choice on our own territory! This is not the only environmental conflict in Minas Gerais today, there are hundreds of them. University research groups such as http://www.fafich.ufmg.br/gesta/ and http://ninjaufsj.wordpress.com/ are working on environmental justice, collecting and mapping such conflicts http://conflitosambientaismg.lcc.ufmg.br/. One of the most urgent threats, in the Serra de Gandarela, can still be stopped although we confront the largest enemy, the mighty Vale transnational company. The conflict is taking place right now in the Gandarela Mountain Range and in Belo Horizonte itself. Take a step forward for Gandarela!